Fun place to watch a game! Always fun & delicious ... especially when our team wins!!! I was very discouraged about trying to use certificates at various restaurants over the last week. Either the restaurant didn’t accept it or they were out of business. The system needs to be updated with current participants and ensure that they will indeed accept the certificates. It was a waste of my time and money at this point. Can’t use a couple of $5 cards to buy a $10 certificate! I have 2 ($5) restaurant.com cards showing in my account, but I cannot ‘buy’ a $10 certificate with them (‘says insufficient credit’...& add another, but it never gets to $10 credit in one spot) & No way whatsoever to get thru to customer service on their form!! It just sits there!!! No help on the website & no way to reach the company any other way online!!! great value for trying new restaurants ! We are locals. This is, by far, the best restaurant in the area! Very disappointed that there are no more than 2 restaurants in my area. Also, the none restaurant offers are such a rip-off. Most of the restaurants listed are not currently in business or refuse to accept the certificate. I tried to use one on Saturday and the owner said he does not accept and said he was signed up without his consent. There are barely any restaurants in my area that uses this service. Always great service, great food in a casual atmosphere! Very clean, friendly and the food was delicious!! I love to find gift certificates for my favorite restaurants. We got 3 $25 gift cards for this app and can’t even use them. Does not even give us a chance to redeem them. Does not even explain how to use them. Waste of time and effort on this app for nothing. I’ve been with Restaurant.com for maybe 10.... more years at this point. Many places are no longer there or do not recognize the coupons any longer for redemption... it’s NOT “user” friendly.... I have attempted to contact them as I should have credits.... most troubling.... it shouldn’t be that difficult! I bought a restaurant.com card and tried to use it on a Green Goo by Sierra Sage Herbs order and it wouldn’t let me. It will only let you use it on restaurants and a few other things. I have purchased several certificates, only to find 5 restaurants in my area that accept them. I finally set a date to go to one of them and BAM! They’re no longer part of the program! Now my certificates have gone missing! I have proof on my credit card statements that I bought them, but my cart shows that I don’t have any. Trying to get a live person in the phone is a challenge. Fix this before I go to my Attorney General, today! I keep trying to use some returned balances I have on my account and it will not let me.... I have several credits built up and it won’t let me use them and I see no contact info on how to remediate issue. The exchanges are not very straight forward but I’ve successfully used these certificates for years. This app keeps logging me off and I am unable to find what I’m looking for and use the app prior it logging me off and making me re-do the process about 40 times before I get what I needed. Very Frustrating, not good for Americans. This is such a huge money saver and I get to try new places that I normally would not. Local and on vacation, Restaurant.com is such an asset. The process is simple so pay no mind to the numb skulls who didn’t understand it. Buy the gift card, go on the site and then buy the coupon for the participating restaurants. More and more restaurants participate daily. Love it! This app is textbook creation of a bad app to hide a mediocre service. 1) forces you to log in repeatedly during same session 2) certificates magically disappear or expire. Fun for rabbits, not so much when on a dinner date. 3) restaurants don’t always adhere to policy on the app. Sent my mother $100 gift certificate for her birthday only to find two restaurants in her town that accept it. After a $42 meal, denied her using credit over $15! This was the last straw. Deleting app and eating crow. Unfortunately you have to spend as much of your own money. No bargain here. It doesn’t work, the will keeps spinning to log into your account! How SLOW can you GO? Find out by logging onto this website. Seriously, Restaurant.com? Get a better tech guy or IT connection. This was four + years ago before the app. I was given several restaurant.com coupons at work. After determining which restaurants accepted the coupons, I was excited to use them. It turned out to be a hassle because I ordered four meals to go at one restaurant, only to find out that they would only allow a few dollars from one coupon, so that was expensive; I took a friend out to eat with another coupon to a restaurant that also didn’t accept them, and was finally able to use one at another restaurant that accepted it once but then never again after consulting with the owner. The first restaurant actually changed their policy and still has a sign on their wall to this day stating that they do not participate with Restaurant.com. This app, as well as their website, is an absolute joke. The amount of time it takes to login and for it to load is ridiculous. I’m sure there are great deals and money can be saved, it’s just a matter of you not going crazy while the app takes 5-10 minutes or about a dozen attempts to login. There are rarely any restaurants local to where I am, no matter where I am. I have tried to purchase for the places local and it always gives me an error. Have a $25 credit & finding it impossible to use it, very frustrating! I Bought $50 worth and made plans to come here and they don’t take this . So how do I get my money back? Terrible. Try adding a code that you purchase, which should be ridiculously simple, and is very difficult to find. Most of the restaurants are ones no one has ever heard of, and both the app and website make them hard to find. I’ll be happy to use my card and be done with this forever. Would have given more stars, deals are great, need more places in our area. The entire benefit of an app, I thought, was to make my experience more convenient that the desktop site. When I go to a restaurant to use a certificate I have to sign in. Then, 10 minutes later when I wish to redeem I need to sign on again. In fact, no matter how frequently I use the app, sign in is required (no option to remember my email address or password) EVERY SINGLE TIME and every singe purchase. I give up. This app is not very user friendly. You need to log in every time you want to use it. It does not remember your login info which makes it inconvenient when you you are paying and want to use a gift card/certificate. Apps are meant to help make things easier and quicker, but this one actually achieves the opposite. You are better off printing out a copy from the website than using this app. Not very many choices 🤔? I purchased vouchers for Bountiful Bread in Albany, NY. With the first one we were able to successfully get our deal. When we went to redeem the second voucher, we were told it was a scam on the part of restaurant. com., and they should never have redeemed the first voucher. I contacted restaurant.com via email and got no response, so I exchanged the voucher for a restaurant called Honeys on Central Ave in Albany. My husband and I tried to find the restaurant. All we found was a closed up store front with no sign that did not appear to be operational. At this point, I’m wondering if this is not all a scam. Down when you need it. I planned for weeks to take my family out to dinner and use one of my restaurant certificates. But the app and website would not work on the Friday night we went out and I ended up paying way more for dinner then I had planned. Disappointed! I don’t like how I have to log in each time unlike other apps. I’d like to just get in & out quickly. Can’t do anything on a phone! You have to report a restaurant from a desktop computer! I do not own one. Super embarrassing when a restaurant won’t except your coupon and says they have never heard of restaurants.com! When the manager tells you it’s a fake coupon! What is going on here can someone get back to me please. My certificate was for $25 and only accepted $10? What’s wrong with this app? Very disappointed. First, you should only have to log in once per use! You should not have to login every time to change from “my certificates” to “my account”! You should not have to keep logging in!!! There should also be an option to never have to login again, but the multiple login per session is ridiculous! Certificates: Once I am in and scrolling through my certificates, the full address should show. As it is now, you can only see the street address—not the town. I have certificates is several towns. I cannot tell where it is. Also, (in this view)you can only “exchange” or “use” — you cannot click the restaurant name or icon and get anymore information (location, menu, etc.) Certificates disappear (without notice). Sure they (probably) become credits, but there is no notification that they disappeared—there should be... and there should be a reason. There have been restaurants where I know I have purchased a certificate and it disappeared—no notice. Sort: you cannot sort your certificates. They just come in some random order, I think it might be the order they were purchased? You should be able to sort alphabetically, as well as location, and dollar amount. Much to my frustration, Restaurant.com allows restaurants to discontinue honoring certificates they issued even if the restaurant remains open and in the hands of the same owner. Buyer Beware. I have had 2/3 of my Certificates cancelled by the restaurants for which they were issued. The new Certificates do not have the same terms as those cancelled by the restaurants. The majority of the $25 Certificates now require that I spend $50. Before I only needed to spend $40! What a ripoff. Restaurant.com should allow a full refund if they change their terms. This app still needs lots of work. It's not easy to navigate and it basically asks you to sign in every time you go to a different section of the app. Meanwhile every time you sign in, you have the option to stay signed in.... Please give us a real update that doesn't sign you out at all. It should also keep you signed in even when you update the app. Bought a certificate and wanted to use it a few months after purchase. Showed used on my account. Never used it. Called customer service and was told I should have called closer to the time I purchased it. Have to constantly enter password!!! I will raise stars when this is fixed. App MUST STORE AND REMEMBER your password. It should stay stored for weeks or longer just like every other app! There are a lot restaurants that keep denying the certificates. The app never loaded. I attempted to sign in via Facebook and the login screen just spins around. What a waste. I’m not sure if it’s the restaurants or restaurants.com. But when redeeming the coupon is really difficult. The restaurant I went to told me I couldn’t redeem my entire voucher at their establishment. They informed me that it was restaurants. com policy. So, why would you give me a voucher $100 that had to be broken down into increments of $25 without letting me know??? What can I do about a valid coupon for $25 off when you spend $40-$50 or more but the restaurant said it’s not a valid coupon. They said they would give me $10 off on $30 but not $25 off - which is clearly what my coupon indicates. Is that legal? Doesn’t seem right when that’s the coupon I paid for. Who do I complain and report this to? The codes do not come up to be redeemed but get lost from unused. I’m sick of paying full price when I have gifts/coupons that can be used. I contacted customer service because I noticed both of my $25 certificates are gone. They were there one day and then the next, gone. I emailed them and they replied with instructions on redeeming and exchanging certificates. There was no real person to help. That was on July 3. I replied again and asked for help and asked them to refer back to my original email since it had nothing to do with redeeming or exchanging. They replied with the same email. The email contained no phone number or any other emails to contact them for help. Instead, it recommends you download the app. So just a warning, if your certificates don’t work or they disappear even after you’ve bought them, good luck. Purchased a certificate with my gift card to eat at a restaurant in my area and it doesn’t load on my account! I sat in front of the restaurant for 30 mins, reordering and reordering the certificate deal, 25$ off for a 50$ or more bill, still not working. Ended up driving to another restaurant and eating there, get home and my email has 10 confirmations letting me know my certificate orders went through and is ready to be redeemed. I rarely use it and it happens everytime. Fix the lag. Bait and switch! You can’t redeem directly at the restaurant. Also, most restaurants on this app have no training on how to operate their end of the system. Went to one restaurant that was listed, only to be told that they never even heard of this app. Customer service wasn’t helpful at all. This app is great! Seems to be very up to date with what is available. Thank you!! App is lame - I cannot enter a card I got. Company running this is nothing but a scam. I have couple hundreds in restaurant.com. 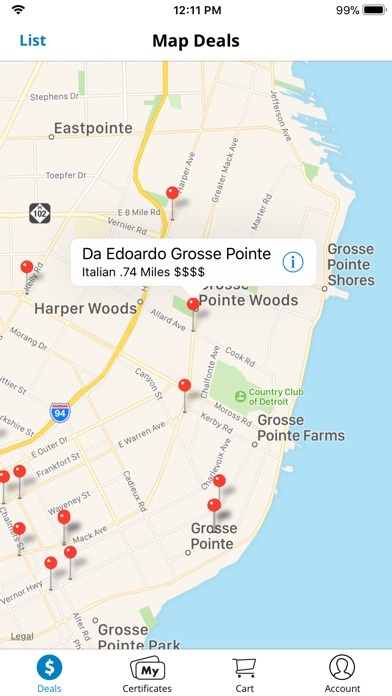 I cannot find any good restaurant around my area to use. I got frustrated when the app signed out by itself every time i close the app. I received these ‘free’ dining bucks for going to a time share pitch. Most restaurants were less popular. When I searched my hometown, I recognized 2 of 15 listed. I had to load the bucks to the app. Then I had to use the ‘bucks’ to purchase certificates for each individual restaurant I wanted to use them at. My first particular restaurant offered $5 certificates, but I could only use one certificate per visit (no matter how many in my party or how much my bill was) and had to have a minimum purchase of $10 to use it! The app doesn’t remember, I have to sign in each time. A pain to use and not really worth the savings. This app cannot seem to remember your login info. Each time you try to look at your account info, you have to re enter your email and password. Are they doing this on purpose? App doesn’t always work. Sometimes says I’ve already redeemed when I haven’t. Logs me out as I’m using it. Map doesn’t show available restaurants. Overall this is an inconsistent app that is usually more frustrating than helpful. Great Deal!! I love it! I wish there was a way to stay signed in. I have to sign in every time I open the ap. Frustrating to find additional unwritten restrictions often recently when we have gotten to the restaurants. After sending an email to restaurant.com the only response I got was “please visit the website to see frequently asked questions.”. We already looked there. Why not answer my question? This function doesn’t work on the app or on the website. What’s going on with that? Despite the words “easy” and “ease” being used over and over again, this app is, as far as I can tell, unusable. When you seek instructions you are told to click buttons that aren’t there. If you want help, you have to make yourself available during work hours. There is an option to email a question, but nothing so far has lead me to believe I’ll find any competent help via email either. Deleting this worthless app might be the better option. It is impossible to redeem any e-gift cards through the app. I purchased 16 e-gift cards and NONE of the codes are valid for purchasing anything from their website. I’ve tried multiple times with no result beyond an error message and a request for my credit card number. Don’t waste your time and money on this scam!! Terrible rip off. I pray people read reviews before buying coupons. I received an email from this website saying I had certificates that I hadn’t used, I had forgotten about them. It seems that some of the restaurants were no longer participating so I had the option to exchange them. I did that and then when I went to use them they were no where to be found, mind you it took me a solid half hour to just get logged in, the website is so slow. I tried logging in on the app and had the same slow experience. Looks like I lost my certificates anyway! All crap! Can’t access any of my stuff 90% of the time. Absolutely trash. App and website just keep spinning. Took forever to sign in, then I click on my certificates and that’s just spinning. Takes forever to load anything, whether it be your account info, searching for restaurants, using the map! I will never Resturant.com again after I use up my credit. This app is broken. I have a code I need to redeem which is why I used the app. When I tap the “redeem a code” button it take me the the home scree (the one I was just on), but it removes the redeem button. So basically you can’t use the app to redeem a code, which is the reason I downloaded the app in the first place! I have tried several times to correct a problem and have not gotten a response in over 2 months... twice the coupon wouldn’t come up to scan .... it came up checked as if it was used. I tried another one and the same thing happened. I had to pay full price for my food and lost both coupons. I have been to 2 other places that do not accept these coupons and again was forced to pay full price even though I had paid for the certificates. So that makes 4 times I could not benefit from things I paid for. I can do an exchange for the certificates I still have but I am leary .... what if they don’t work either. Do I lose more money??? I bought a lot of certificates and have purchased many gift cards also. First restaurant we went to had the wrong hours posted on the website. The second one we went to wasn’t even participating in the program but Restaurant.com hasn’t removed them even after being told by the restaurant. These people need to get their act together! I have attempted to use several vouchers and every single time the restaurant refused to honor them! This site is great for money events and entertainment. Always asks you to sign in. Seems hard to navigate, Groupon it is not. The majority of these restaurants are out of business, look like that you wouldn’t feed your dog there and most don’t even honor this crappy gift card. Waste of time and global travel company are frauds too!!!! Bought several certificates for a new restaurant Iiked, BUBBLE SHACK. I went there only to find out that they never participated with Restaurant.com. You guys sell certificates/give discounts on their behalf without anything in return for them. Not cool at all! This app and site always introduces me to new “destination” restaurants which is now a new hobby. Look for a type of food to enjoy and go to that location to explore and work up an appetite. Plus the savings with the meal goes for the gas!! I am finding it very difficult to use and exchange my certificates. I have the App on my iPhone, why do I have to sign-in Everytime I open the App to see my Certificates. Please fix this, by Updating your App. This is a real Inconvenience. Great deals, all the time! Why not update the app to save the password like so many other apps? I was gifted $250 of coupons on restaurant.com 3 months ago and have not been able to redeem it because the system will not let me submit my coupon code. When I click ‘Redeem a code’, the menu just refreshes and now the option to redeem a code is gone!! After searching through the app and online website I cannot figure out how to actually redeem a code, which you would think is straight forward. So I go to their ‘how to contact us’ page and who would have guessed, instead of giving instructions on how to contact them it just redirects to some page of unorganized and circular help tips. This should be a simple app but instead it’s literally the most frustrating thing I have ever used. I bought a few certificates a couple years ago and used them. I thought they were good deals. Spend $50 at the restaurant and get $25 off. There was lots of restaurants to choose from, good ones too. Now there are merely a handful in my area (a major metropolitan area too!) and they are all subpar quality. There is literally one good restaurant and it has said "sold out" for the past year. I had 2 certificates left that I hadn't used and now both those restaurants have pulled out of the program and I am being forced to exchange them. Except there is literally only one restaurant within 100 miles that offers a $25 level certificate and it now requires a $75 minimum purchase. What a ripoff. My husband and I had a hard time getting to $50 at some of these low brow places, how are we supposed to hit $75? They are basically cheapening the deal without a good discount. They must have done something to piss off all the good restaurants because no one is participating in their program now. Waste of time, these "deals" are anything but. Great tool to good food! The app, as well as the website, are so difficult to navigate. You have to log in to multiple sections of the app, if you navigate away, you have to log in again. I have gift cards to use, but when I add a certificate to my cart, there is no way to use the gift card toward it. If I try to purchase a certificate from the gift card page, it just takes me in circles and doesn't actually let me purchase a certificate. I've had these gift cards sitting in this app for almost two years and am unable to use them. Use it all the time. Easy convenient and always produces a savings. I had trouble signing in so I created a new account. I just checked out with PayPal and received a receipt from PayPal but the checkout won’t stop loading. Frustrating! I hope the user interface will get cleaner and more user friendly by March of 2019! I have no clue how to use this app. I have 60.00 in Credit and everything I look at says I need to spend money to get these deals. I wish someone would give instructions on how to redeem money on this account. Awful app. I have to type my username and password every time I want to open it. No option to enter gift card. The sole reason why I downloaded the app. Says it easy to use with easy to follow instructions. I have used restaurant.com once before and since then it’s been IMPOSSIBLE to sign in and buy from this site and app. I’ve tried over 5 times and it just lags and lags. Never finishes loading so I can sign in. Would not recommend. I was at an Indian restaurant with my dad last night and discovered thee restaurant was in Restaurant.com. I have several gift cards waiting to be used. I pressed “redeem-now” to buy a coupon, but when I selected the restaurant I was sitting in, it wouldn’t let me do it and wanted to go directly to my credit card. This needs to get fixed! A lot of restaurants on app doesn't admit it! Very hard to use coupons! 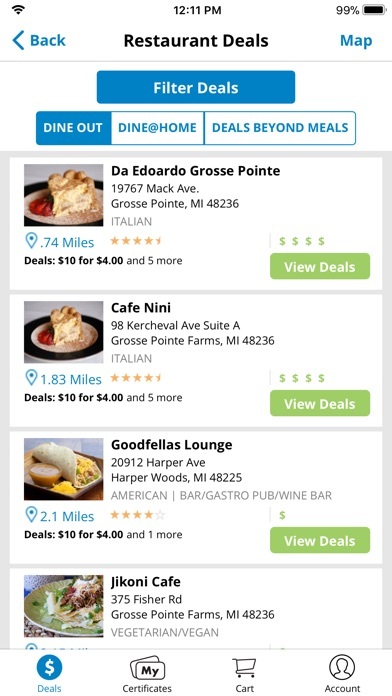 I bought a lot of coupon from this app, but when I went to the different restaurant, a lot of restaurants doesn't admit it, they told me they don't have business with this company, so they don't accept the coupon, but a lot of restaurants still have name on the app to cheat people to buy the coupons. I called the restaurant.com to ask them to return the coupons which those restaurants doesn't accept it, but they refused to give me a refund! So now these coupons became a garbage, I really waste a lot of money!! Not enough restaurants and the only ones participating are horrible. Several restaurants quit which resulted in some of my certificates being cancelled. Contacted customer service several times to try to combine credits and absolutely no response at all. I can’t sign in using my google account on the app. Until they add the option to app I’ll have to use the website. I gave this app a 4+ because while they always have a lot to offer as far as activities, they just don’t have enough restaurants in my area. I know Delaware is a small state but we have many eateries that are missing from list. What about DDD(3d’s) which is a sub shop in Newcastle? Seasons Pizza, Pat’s Pizza, Gino’s Pizza, Jade’s Palace, OB’s Jamaican food, Spice n’ Nice Jamaican, Cheesecake Factory, Thai Kitchen, Osaka, Hibachi’s, Potstickers, Jasmine’s, Kenny’s Restaurant, Olive Garden, Texas Roadhouse, TGIFridays, The Brown Bag & the brown bag 2, Celebrations on Market, Red Lobster just to name a few more for your list. Otherwise, I really like the app just wish most of the offers for most restaurants weren’t in Philadelphia, the next state over from us. If I could give it zero stars I would! It’s a waste of time and effort. You can’t even use these certificates! Have had wonderful experiences ..Thank you! I have tried to use this app 3 times now at the ice cream shop I have the certificate for. It’s the same thing every time. I try to login but it says my password is wrong so I do a forgot password. The email comes through but when I try to change my password it just spins forever. At this point I pay for the ice cream. The next day on a desktop site, I am able to change my password and login. The next time I’m at the ice cream store, the app has logged me out and I get to perform this process all over again. I guess I need to print the coupons, which defeats the purpose of using the app. Disappointed. Outstanding authentic Mexican food cooked the right way!!! Lunch is generally packed! I like be this app! It helps me find new yummy spots and is always a good deal! Please read the fine print. I purchased the date night special and it led me to believe I could use all my gift cards at once. There are stipulations and can use only one at a time. Not worth it. I stopped using years ago because you really aren’t saving any money. I just restarted because I got free $25 from T-mobile. I lost a certificate and couldn’t get it back. I redeemed only $15 worth and $10 leftover disappeared from my account. No one wants to answer your questions. This is just poor app and service. Like to constantly login? You’ll love this app. Deleted it after 1 day of frustration. Can’t seem to use my 25 gift cards anywhere!! It’s annoying. Scam! You fooled me only once. This company is a huge waste of time. The restaurant options they have are BEYOND disappointing, close to embarrassing. The restaurants have enough restrictions to write an encyclopedia. I knew this was too good to be true. It would be great to have a map of the deals we’ve already purchased. Where else can you purchase the discount coupons that Restaurant.com offers ! We absolutely love them ! Thank you Restaurant.com !!!!! Few options to pick. Mostly Mexican. Please increase options for all types of entrees. Super buggy! I have to close out after each piece of a transaction for it to work. Can’t combine certificates to purchase a larger denomination certificate. Please fix! I had not used the app in 8 years because it was so cumbersome and frustrating to use. I just remembered I had those certificates and years later when ready to use, as if time stood still. Not too many places to choose from. It’s Ok, if only it worked. You try to get credit for certificates you’ve exchanged and try to use the credits later but doesn’t show where the dollar credits are shown on the website! I struggle to find restaurants that are on the list. I’ve tried two restaurants listed but neither participated in the program but were still listed. I’ve had $100 worth for a year because no one will take them. Every restaurant I have tried using my certificates for are either closed or no longer serving food. When I try to redeem a e-card from Verizon I only have the option to choose a restaurant in a major city. I don’t live in a major city. Wish I had never chosen this reward! Need more restaurants near me. Took my wife and kids out to celebrate her birthday. 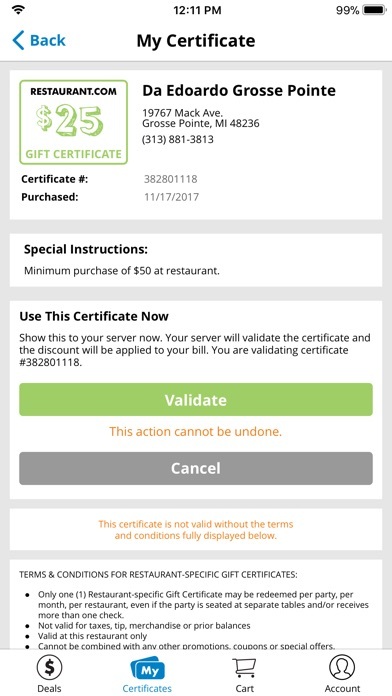 Located a restaurant on the app, all excited and wanted to redeem/utilize my certificate, only to be told they do not accept 😡😡😡😡....ON MY WIFE’S BIRTHDAY AND IN FEONT OF MY KIDS!!! Had to pay out of pocket. Wish I could get a refund of my money!!! Besides the multiple logins required, I tried to add a code to my newly created account. After several try’s and reading the FAQs, I got it done by logging in on the full website. Just not intuitive and poor mobile web view realization. Redeeming a Restaurants.com Gift Card. It is not a seamless process to upload a e-gift card to my account using the app. It disappears if you don’t book anything from the time you click on it from your email. Very frustrating! We all loved our food! I will be going there after church a lot! Clunky and far from worth it. Though not an outright scam since I’ve been able to use a few of the coupons, you will end up paying dearly in time and hassle for paltry savings. Often times the site and applications throws up obtuse unhelpful error, as when you are trying to change a coupon to a different restaurant. For the last 24 hours ive been unable to login or change my password, being told only (and repeatedly) to try later. Even if it happens to be working, the whole process is slow, clunky and unintuitive, and your server probably won’t be thrilled to see it either. Avoid this app. and company. Is this a scam site??? I’ve been trying to reset my password and it keeps sending me a try again later message.. I love this app. Every coupon I’ve downloaded so far is legit. You get tons of food for a discounted price! Can’t beat that deal!!! The interface is poorly designed. Connects to a stupid webpage to log-on every time. App is designed by an idiot. This is just the mobile site, and it’s clunky and poorly managed. It’s nearly impossible to find where to enter a code to start adding coupons to your list. It uses the word “Redeem” even though you aren’t actually redeeming, which is confusing. I have to log in EVERY. SINGLE. TIME., even just to see which coupons I have, not just to shop or redeem. 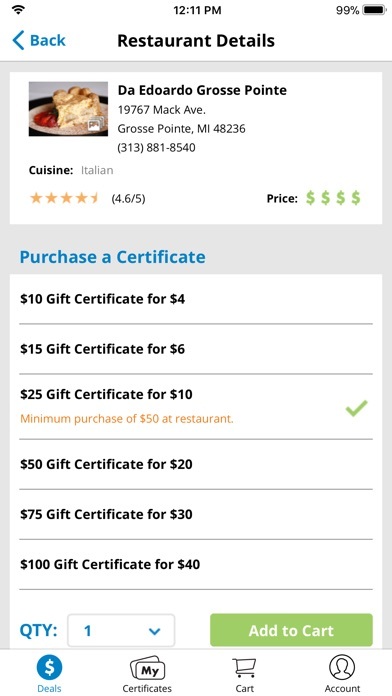 I’ve been using this app for a couple years because people keep giving Restaurant.com gift certificates. I wish they’d stop. Fewer and fewer restaurants around me are accepting this stuff now. You removed literally the only redeeming factor of the app. Bought two $10 certificates of Anchal restaurant, Long Island City, NY and they are not valid at Anchal restaurants. Restaurant manager told me that restaurant.com don’t confirm with them for any certificates. Also, Application is not that good. Very unhappy and feel cheated! I bought a gift certificate then went to the establishment only to find out that I had been closed down for over a year! So why would they still be selling gift cards for a business that is closed permanently? Not happy at all! Went to restaurant they said they had no idea they where enrolled in the programs did not accept coupon they where checking who signed them up. This is the most horrific app I have ever used. Not user design friendly whatsoever and does not save you any money as advertised. Complete waste of time. Five thumbs down. Garbage. They let you buy credits but then you have to add the credits to your account! (Why wouldn’t it just be on your account) When you try to add these credits to your account it says that you’ve redeemed the credit but your account only shows $0.00 and you can’t purchase anything. Thank you for ripping me off. This is a waste of time and energy. This app is a joke. I clicked redeem a code, it then takes me to the next screen, which is the same menu with the same options, but now minus the redeem a code option, and it should go without saying without giving me anywhere to enter my code. Great app. Clearly great developers. Keep up the great work everybody. Yaaaaaaa. The app, as well as the service is just another scam! The minimum purchase required is ridiculous and the restriction are as well..... what ever happened to the days when a coupon was a coupon and a special was a special! This is just advertising and promotion for restaurants, not something I would ever spend my money on! I feel like you get much better deals on Groupon! this was just a scam to steal my money. buyer beware. I have an account with Google but the app doesn’t have the option. This past week while on vacation I tried to use 2 different Restaurant.com certificates and found the entire experience to be arduous and not worth the time and effort. For two different restaurants we watched as staff fumbled around for up to 20 minutes trying to figure out how to apply the certificate. If restaurants are going to be part of the program they should train employees on how to apply a simple coupon. At Senor Frogs in Vegas, we had a horrible experience with the manager from the establishment as he played coupon dictator, then wanted to accuse us of doing something wrong or nefarious with the certificate, when in reality he doesn’t know how to operate technology. So to sum it up, if a tiny discount is going to require hours of my time to watch uneducated staff fumble around and hold conventions at a register as they try to figure out how to key in a tiny discount, then I will pass on future ‘savings’. It was an experience to say the least and I would never use Restaurant.com again. Thanks for the memories! Received a $100 gift card but you have to redeem the code through the app. I downloaded the app but every time I tap on the redeem code button it never loads. I have left my phone on trying to load and it still won’t. Frustrated and irritated on what I should do. Excellent food and service !! Great variety of American breakfast lunch and dinner items. Great tasting food and friendly service. We had a steak sandwich, schrimp angelica(Alfredo), and omelets. All were terrific. Highly recommended. App keeps telling me there’s an error to try again later. I’ve been trying all day!!!!! This app is awful. I try to redeem credits I have and have to go to the full website to put in the codes. I try to use those credits, and it pushes me to find a restaurant to redeem them. I do that and try to redeem the certificates, and then it pushes me back to the certificates to redeem them for the restaurant, which then pushes me to find a restaurant in a never ending unredeemable loop. Love the discounts but there aren’t enough places to go. Also have gone to places that are listed and are out of business!!! Can't redeem certificates. Nothing loads. Good luck finding any half star restaurants. Then, good luck redeeming your “”gift cards””. This is straight robbery. There are no good restaurants to choose from! Can’t claim codes on app. Never loads when you try to redeem a code. Now I have to print them from website. How can I setup to use auto login on my iPhone with my thumb print? I don’t understand. I just got a $50 card with code on the back. But when I put the code in online it says invalid. How am I supposed to use it? Like cash? I won’t be using this app again. Used my points that took forever to get to begin with, and got restaurant vouchers. So far have used 1 and the restaurant food was horrible plus had to spend 30 dollars at the restaurant in order to get 15 off . Basically this is a coupon not a voucher for a meal. I tried using another one and the restaurant is closed for business. So needless to say this is not a great app. I have a Dining dough card that takes me to this app. There is no option to add the certificate I have in hand? I don’t want to buy a new certificate I want to use the one I have. Easy to buy and use. $4 for $25 sale is awesome! I’ve only managed to login once. Never signs in and way to slow. I can not log into my account and have been trying for days! Have followed all instructions too. I don’t think they really want you to use it. Had a code years ago and it was never able to be used because restaurants don’t want to validate and now my new one probably is going to be just as much of a problem. This is stupid! Really bad restaurants. And website / app no longer work. Good restaurants are far outside town and can’t redeem 4 $25 coupons so stuck in limbo. I typically have to sign in about 3 times per session, even though the “leave me signed in” box is always checked. My credit card and bank apps won’t even prompt for that level of security. God forbid someone gets their hands on my Pizza Hole vouchers. I just updated this app twice in one week and it seems like they only changed the color to green.. This app needs lots of work. It's not easy to navigate and basically asks you to sign in every time you go to a different page. Meanwhile every time you sign in, you have the option to stay signed in.... Please give us a real update that doesn't sign you out at all. You should be able to stay signed in even when you close the app. The new update does not allow you to click on the certificate to see the rules of the certificate. The rules are very important as they tell you which days you are allowed to use the certificate and how much you need to spend. Please fix the app. It is hard to redeem coupon. FAQ did not work at all. I do not want free food and delete this stupid app. App NEEDS To be fixed. It won’t let me purchase the gift cards to the restaurants. I try entering the letters but it doesn’t work. Why have an app that doesn’t work. So, i went to the website tried that way. Nope can’t even do it that way. What the heck. This isn’t cool please fix. I have 7 restaurants.com gift cards to redeem and I can’t. What a total waste of time and money. I also lost my certificates but I sent an email and received a very explanatory email on how to retrieve my certificates. Without knowing I mistakenly ordered 4 $25.00 certificates not realizing that I would have to purchase $50.00 or more of food for each certificate, so shop accordingly. Horrible, deal don’t even exist at most restaurants. The app is hard to use and can't do near what the full website can. Awful customer service. If you have a question it's a stated 3 business day response time. Very few good restaurants available. Avoid this company if you can. This might be the first time I actually review an app and that is because I found it the be the most useless app I have ever HAD to use. I had to download it bc I got a $25 certificate to redeem from it. The app would not work at all. It’s confusing as heck and don’t try to go to the website bc it might just be worse! Your restaurants for Lawrence Kansas are one star. My wife and I have gone to cosmos Indian restaurant several times and we’ve never found it open. It’s more of a little store that it is restaurant. The second restaurant have listed for town by the name of taste of Haiti is also a bad representation of our city. Literally nothing to choose from. Come on, this is just such a weak list. It is too hard to use. When I was accidentally deleted my mail, I can not use my money on it. Even though I call them to help me, recovery my money. Also when you buy something you really need, it always make you trouble. I just waste my money on this. The discounts aren’t as good as they used to be. Now you mostly pay $6 for $10 voucher. Sometimes it’ll accept your password and sometimes it won’t. Just logged on and was told I have no certificates. An hour ago, it showed half a dozen. Makes you want to avoid Restaurant.com. This app is complete garbage! It takes forever to figure out how to redeem a code and the gift codes are not even redeemable at restaurants. Half the time it wants you to buy a certificate but won’t let you redeem them. I was given these as gift and would never buy them or suggest anyone buy them for someone. Would give 0 Star if I could! It will not even let me sign in to work through any of the functions. I have to sign in through my safari app instead. When I originally joined, there were so many restaurants to choose from. 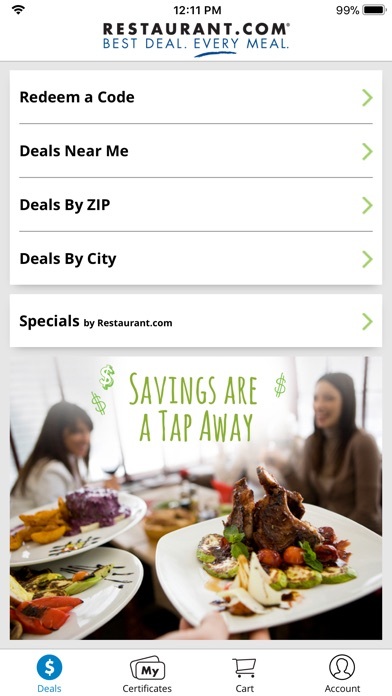 I enjoyed exploring many new restaurants and getting a great savings at the same time. Over the years, the number of restaurants have become so few and the denominations so minimal, not hardly a bargain any longer. Now I am left with so many certificates and nowhere to redeem these larger demonizations. Why aren’t they getting more restaurants? What restaurants are this ? It can offer you great deals, but for me I had a couple of negative experiences, after I purchase a certificate the restaurant went out of business and the only way to find out is by going there or try to call if you find a phone number listed. Or some times you find out that the restaurant is not longer accepting restaurant.com certificates and it’s unfair that they tell you after you already purchased the certificate. It’s hard to buy certificates sometimes because it says that you don’t have enough money no matter that you are trying to pay with a gift card that has mora than $100.00. All I got to say is that once that I’m done spending my money on the gift cards that I already purchased with restaurant.com I will discontinue my business it’s not worth all the hassle. Service was friendly and welcoming. Food was good and plentiful and prices were reasonable. I will eat there every time I visit Williamsburg’s. Total garbage, every restaurant I go to says the same thing that they never signed up to be on this dumb app!